Did you happen to watch the Valentine’s Day episode of The Biggest Loser? We loved the way letters from home (and, later, letters from teammates) played a huge roll in this episode. In the team challenge, letters from home were the reward for the winning team. 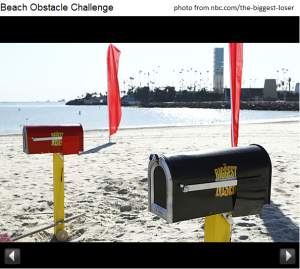 Contestants had to dig their way through several obstacles in the sand, and the thought of getting to read those letters after being away from home for 6 weeks was a huge incentive to the teams. When the winning team members sat down on the beach to read their letters, they were visibly moved by the words of encouragement they held in their hands. Many cried. All said that the letters helped them tremendously and gave them the emotional boost they needed to continue. Later in the same episode, two contestants who had been separated from their teams received encouraging letters from their teammates. Both received the letters at a particularly difficult time during the week, and both said the letters gave them the strength to keep going, and that they could feel the support from their team. We’ve said it a thousand times, but this mega-hit television show proved it in front of 6.4 million viewers. Never underestimate the power of the pen!